Traditional flavour of Thyme. Aromatic leaves season meats, poultry, stews, sauces, soups and dressings. 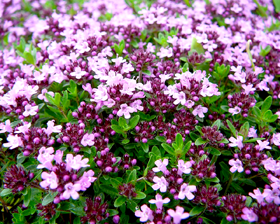 Handsome low-growing plants makes great ground covers in small spaces. Sow seeds February to April thinly on the surface of a free draining, moist seed compost. Cover seeds with a sprinkling of vermiculite or compost. Place container in a propagator, or in a sealed polythene bag, at about 13-15C until germination which averages 21 days.